Hard flooring (not to be confused with "hardwood") is a family of flooring materials that includes concrete or cement, ceramic tile, glass tiles, and natural stone products. Ceramic tile are clay products which are formed into thin tiles and fired. Ceramic tiles are set in beds of mortar or mastic with the joints between tiles grouted. Varieties of ceramic tiles include quarry tile, porcelain, terracotta. 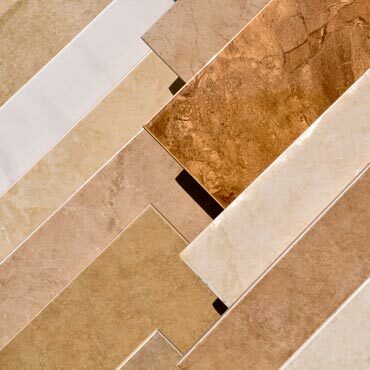 Many different natural stones are cut into a variety of sizes, shapes, and thicknesses for use as flooring. Stone flooring is uses a similar installation method to ceramic tile. Slate and marble are popular types of stone flooring that requires polishing and sealing. Stone aggregates, like Terrazzo, can also used instead of raw cut stone and are available as either preformed tiles or to be constructed in-place using a cement binder. Porcelain stoneware can be used instead of natural stone. It is a ceramic material like a tile; however, it is typically 20 mm (0.79 in) thick and often comes in squares of 60 cm (24 in). Concrete or cement finished floor is also used for its ability to be treated for different feel and its durability, such as polished concrete. Epoxy resurfacing of concrete flooring is used to update or upgrade concrete floor surfaces in commercial and residential applications.